Maximum heights will be increased by as much as 30 feet in some areas in the plan. 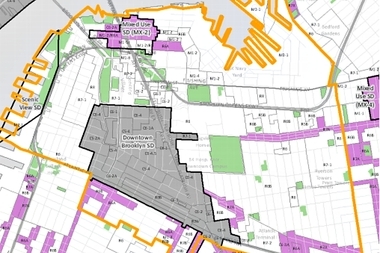 CLINTON HILL — The Department of City Planning will give a presentation Monday, Sept. 28 at Pratt to discuss two zoning proposals and how they would affect Fort Greene and Clinton Hill. The open forum takes place from 6 p.m. to 7:30 p.m. at the Higgins Hall Auditorium at Pratt, located 65 St. James Place near the corner of Lafayette Avenue. The two zoning proposals, “Zoning for Quality and Affordability” and “Mandatory Inclusionary Housing,” will set the standards that determine how much affordable housing developers will construct in the area. Maximum building heights will be increased by as much as 30 feet in some areas, according to the plan. “We want to provide community residents with the opportunity to ask questions and provide comments on these zoning proposals, especially as they relate to raising height limits and the potential impact on our neighborhoods,” said Meredith Phillips Almeida from the Myrtle Avenue Brooklyn Partnership.